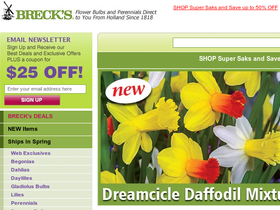 Shop Brecks, online at Brecks.com, for over 190 years of experience in offering the finest bulbs and perennials from Holland. Brecks offers a large collection of top quality tulip bulbs, daffodils, lilies, hyacinths, Dutch irises, amaryllis, dahlias, begonias, gladioli, crocus, perennials, and more. Brecks offers a harvest of bulbs which grow and bloom best in all parts of the U.S. and offers landscaping tips and care tips. But before you enhance your garden, get all the latest Brecks.com discounts, Brecks promotions, and Brecks coupon codes found here at RetailSteal.com. Brecks ships within the 48 contiguous United States and 14 Canadian provinces via U.S. Postal Service, United Parcel Service or Canada Post. See site for more information. Save $25 when you shop online at Brecks.com. Click our special promo link to shop and enjoy discount with purchases $50+. Click link to find out how to earn 12% cash back on your purchase from Brecks.com. Save up to 50% on Fall-Shipping Collections from Brecks. Click here to save on a variety of bulbs. Save up to 35% or more on a colorful variety of tulip bulbs from Brecks.com. Click link to shop. Shop at Brecks and save up to 35% on a beautiful collection of lilies. Click here to get started. Get a $25 discount and receive exclusive special offers from Brecks. Sign up to their mailing list for savings. Save up to 30% or more on the latest selection of bulbs from Brecks. Click link to shop.